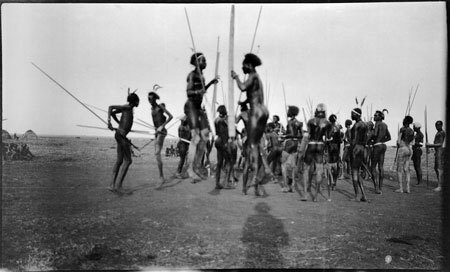 Two Nuer men perform a leaping movement (rau) as part of a dance, one holding a large-bladed spear, the other a very long ambatch parrying shield. Many of the youths have smeared ash on their lower legs. In the distance on the right can be seen several beehive huts often made at dry season camps. Such dances were regular social events, often also accompanying ceremonies such as marriages. Such events were the main arena for courtship among Nuer youth, and often took the form of mock battles and display between village groups. Morton, Chris. "Nuer dance gathering" Southern Sudan Project (in development). 03 Jan. 2006. Pitt Rivers Museum. <http://southernsudan.prm.ox.ac.uk/details/1998.204.5.7/>.